Antibiotic resistance is one of the most important challenges to health care sector worldwide. In particular, multidrug resistant bacteria causing nosocomial infections such as Acinetobacter baumannii raise great concerns. Previous studies in Vietnam were mostly focused on clinical epidemiology and determination of antibiotic resistant bacteria ratio. Investigations on mechanisms of action through resistant genes activities or molecular epidemiology of endemic resistant bacteria attracted much less attention. This study aims at clarifying the mechanism of action of imipenem resistance through blaOXA genes expression in some A. baumannii clinical strains isolated from three hospitals in Southern Vietnam. Determination of the relationship between blaOXA genes expression level and imipenem resistance showed that induced strains bearing blaOXA-51 gene expressed weak and unchanged blaOXA gene. However, strains carrying “blaOXA-51, ISAba1_blaOXA-23” and “blaOXA-51, ISAba3_blaOXA-58” highly expressed blaOXA genes under imipenem induction. The ISAba3 insertion sequence was identified in all strains harboring blaOXA-58, but only one strain possessing ISAba3 upstream of blaOXA-58 gene exhibited an upregulation of blaOXA-58 gene when induced. The ISAba3 insertion sequence was intact, uninterrupted by other insertion sequences as reported by previous studies. This study provided new insights into the mechanism of imipenem resistance, an essential antibiotic used for the treatment of multidrug resistant A. baumannii. Data collected in this study contributed to the understanding of multidrug resistance characteristics of clinical A. baumannii strains isolated in Vietnam. 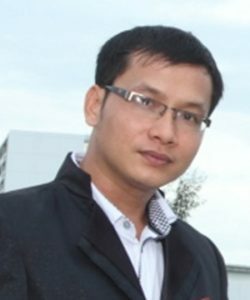 Nguyen Tuan Anh has just completed his PhD from University of Science, Vietnam National University Ho Chi Minh City. His studies focus on the detection, quantification, genotyping and drug resistance mechanisms of bacteria and virus from different clinical samples. Now he is teaching at the University of Medicine and Pharmacy at Ho Chi Minh city and head of molecular diagnostic group at University Medical Center.